Greetings friends, and welcome to another exciting race report from the wilds of the Muskoka region! Yup, that’s right, once again, I made my way into the beautiful lands west of Ottawa and north of Toronto. This time, I was taking part in the RockstAR Adventure Race, an 8-hour rogaine-style adventure race (more on this later), with my friend and team-mate of years gone by, Carl. And for a change, I actually wasn’t covering this event for the magazine. I was bona-fide just there for some fun and a good hard race with no thought being given to capturing good footage to distil the entire event into a little video. Of course, that doesn’t mean that I didn’t have a camera with me, and to those ends, why not check out some of the pictures I took before reading the rest of the post? It was another fun-filled weekend, with great weather, and a pretty cool race experience. Find out all about it after the jump! 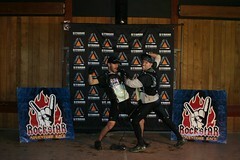 Not only has the RockstAR race been running for the past 5 years now, but it was also voted by readers as the Reader’s Choice Winner in 2011 for Adventure Races. This of course was part of the allure to trying it out. Also, this whole ‘rogaine-style’ approach intrigued me. We were given a little advance notice as to how this would play out. Basically, the race would consist of 2 distinct legs. 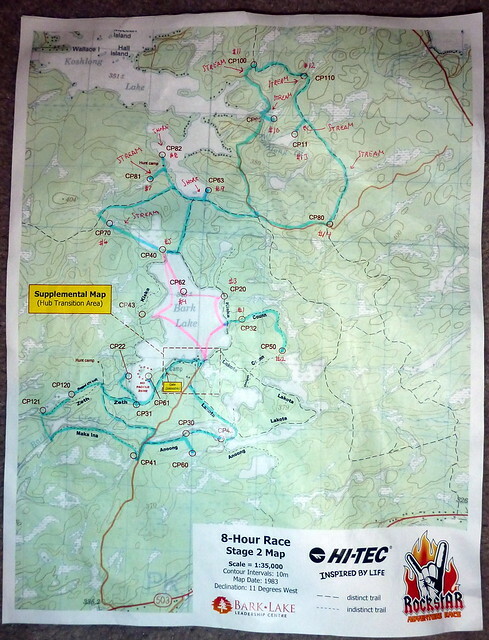 The first leg was a 25km marked mountain bike section through ATV trails, gravel roads, and a bit of pavement to get back to the Start / Finish area. There would be no CPs along this section, just a race to get back to the ‘hub’. Leg 2 would consist of 30 checkpoints to be tackled in any order. They had different point values, and the intention was to get as many as you could before the time cutoff via trekking and paddling. The race was to start promptly at 11am (remote start), and would end promptly at 7pm. Each minute you arrived at the finish past that, and you’d lose 10 points. The point ranges for these CPs was 20 all the way to 120, which was meant to reflect the difficulty of getting a particular checkpoint. Historically, no one had ever ‘cleared’ the course. What does that mean? Well, racers had to spend some time planning out their plan of attack to get as many CPs as they could, while deciding which ones to possibly drop from the list in order to finish in time. The other thing that meant is that you had to be able to change the plan on the fly as you went, in order to maximize points. Ultimately, this also resulted in everyone pretty much being out there for the full 8 hours. This differs from other adventure races billed as an 8 hour race, as top teams can finish in 5-6 hours. Nope, we’d be out there the whole time, and needed enough food / drink to sustain the pace all day. So how did we fare? Read on! As you can see from the above stats, we had a good race. In fact, I’d even say a darned good race. Sure, we would have liked to grab a few more CPs, but that was not in the cards. As it turns out, only one team, the overall winner, managed to get all the CPs. We set out an ambitious plan, and did well, but also made the right decisions on when to skip CPs. With just a little more speed, we probably could have picked off one more, and with a little luck, would have gotten the points for one of the CPs that we visited (I’ll explain shortly). First thing in the morning, we got an early start by having breakfast in the main dining hall with other races. Following that, we registered and got the race maps, giving us nearly 2 hours to decide on a course of action. The picture above shows what our overall plan was for grabbing CPs. We also had to submit a copy of this to the race organizers, just in case we went missing and they had to know where to look for us. Safety first! We managed to plan out a course to get all the CPs, just in case we had time, but also discussed our ‘skip strategy’ depending how we felt. It boiled down to 4 ‘sections’ in our minds. Section 1, the bike. Section 2, the ‘east’ and ‘north’ CPs. Section 3, the ‘south’ section, and Section 4, the ‘hub’ section. We could tweak a few things if needed to ensure a 7pm finish. The bike section was really fun, and had a great flow. It was nice to just focus on the biking, rather than have to find CPs along the way. The course was easy to follow, and basically made it a great way to spread the field out. We covered the 25km in 1:09:19. Looking casually at the results, it looks like that made us around 9th to complete that section, which was a strong time. To make this, we pushed hard, and worked with another team to draft some sections. Carl faded a bit towards the end, but we pushed on. The top team finished barely 10 minutes ahead of us for this leg. I was quite happy with this result. Admittedly, Carl and I haven’t raced in almost 2 years together, and he hasn’t been doing all that much serious training or racing, so this was totally understandable! Finishing that quick gave us nearly 7 hours for the rogaine section. With that in mind, we immediately decided to focus on clearing the full east and north sections, as they involved the most distance, but also had a lot of high-value CPs in the offing. We made an on-the-fly decision on how to tackle a few of the early CPs by foot rather than head out on boats, and were happy with that decision. Then, it was in the canoe to reach some of the shoreline CPs before parking our craft and going for the long march in the ‘north’ section to clear it. We used a combination of quick walking and light jogging to try and keep momentum up. Luckily, most of the CPs were relatively easy to navigate to. I carried the lead, and did the navigation as well, using our agreed-upon plan and route. We get close to each CP, and I’d run ahead to punch the CP card and insert our timing chip. I’d then yell back at Carl to turn around (if we were on a spur), or continue on the trails. Most CPs were on very easy landmarks such as trails or streams, dams, etc. I was really happy they were that easy. A few involved a bit of bushwhacking or stumbling over a lot of deadfall, but that’s to be expected. Whenever our pace would dip a bit, and the trail allowed it, we’d pull out a tow system so I could help take a bit of the load off Carl and keep moving forward together. With all my trail running, this was clearly my forte, so we had to work smart to keep a consistent overall pace during the long hot slogs on gravel roads, ATV trails etc. It worked very well, and we kept reminding each other to eat and drink, as well as encourage each other the whole time. In other words, we worked very well as a team, which gave us more strength together than if we’d just gone individually. One by one we picked off all the north CPs, and eventually were back at the boats. Timing was good, as we’d both run out of water, but both of us had some stashed in the canoe. We’d also made a decision during the north trek to cut out the 2 highest value (120pts each) CPs in the south, as it was clear we would NOT have the time. We also pieced together a slightly revised route that saw us do a bit more paddling to pick up some of the south CPs clumped together near the water, rather than attack them by foot, which had been our plan if we’d gone for the 120s. This would give us the time to clear most of the other south CPs, as well as clear the hub CPs. It was a solid plan, and gave us renewed energy to tackle them. Included in that clump was the first ‘fun’ CP, which was an inner tube hand paddle out to an island to reach a CP, the kick back. Only one of us had to do it, and I was the lucky guy. At least it gave me a chance to cool off in the water and gave Carl a chance to take a little rest in the shade. By this time, we were closing in on 5:30, and knew we had to do a mandatory check-in at the hub by 6pm or risk disqualification. We took a gamble after the inner tube CP and paddled to grab the 2 other nearby water checkpoints. That left us with a mad paddle back to the hub to make the cutoff. In the end, we punched in at CP “B” at 5:54pm, leaving 6 minutes to spare. Whew! Close call. It was now on to the final part of the course for us. We decided to grab a couple more of the ‘fun’ CPs near the hub before heading south for the final hour. First up was an underwater CP which Carl took. Basically, swim out, dive down, retrieve a CD, and bring it to a volunteer. He polished that one off double quick, and we were off next door for the ‘rock star pose’ CP where you just need to pose for a picture to get the CP. WIth that done, we set off at a trot for several kms down the road to reach the final ‘far’ CP we hoped to grab. After that, a loop back on a trail to nab 2 other CPs on the way back to the hub. Here we had to skip a 60 pointer that was a couple hundred meters off the trail, as we knew that bushwhacking to get it could very likely cost us more than a few minutes at the finish line. With that in mind, we were ready to head home and grab one final CP before punching in at the finish. Sadly, that final CP was more of an insult than anything to us. This was the infamous ‘slingshot’ CP. We each had 3 loonies as part of our mandatory gear, and at this CP, we had to shoot these at targets 25m away. If you hit it, you got to punch in for 40 points. If you miss, no points. Well, we gave our best with 6 shots, and missed all of them (we weren’t alone in missing). Accordingly, we were denied our 40 points. Kinda sucked to actually make a CP but not get credit 🙁 I attempted bribing the volunteer to no avail! Oh well, we finished the final dash to the finish and punched in with [again] 6 minutes to spare. That’s exactly how it should be in a rogaine. As close to the wire with as many points as possible. Hugs all around, job well done, and big smiles on our faces! The post race was already underway, with food being served in the dining hall, and the bar open for business at $5 a drink. We decided to first shower, pick up our bikes and gear, then turn our minds to celebrating with fellow racers. The rest of the evening was spent enjoying food, beers, and the company of great racers swapping stories about their day, and of other past race exploits. This is always the highlight of a long day racing, sharing ‘war stories’. To entertain us through the night, there was also a fellow playing tunes on a guitar. We were amongst the last people to turn in for the night, and had a great time. Welcome to the second post detailing some of the awesome experiences Deanna and I had in Morocco. This time, I’ll take you a bit off the beaten path, and talk about two particularly awesome experiences. Namely, the high of trekking and climbing in the High Atlas mountains, including sumitting the highest peak in North Africa, as well as the lows of heading to the depths of the deepest caves in North Africa, the Friouato Cave system. For Deanna, these were particularly fun, as she had never climbed a mountain before or gone cave exploring. In another post, I’ll visit a first for BOTH of us, but this time, it’s all about Deanna’s firsts. 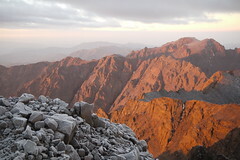 If you check into flickr, you’ll eventually find pictures from both, but for now, only the Atlas Mountain pics are up. Eventually, they’ll all be in the collection though. For now, I’ll just give you a bit of the blow by blow in written words. Enjoy! It’s no secret that I love the mountains. I’ve now seen some pretty incredible ones in several continents. This includes the Rocky Mountains of Canada, a few different peaks (including the mighty Aconagua in South America) on travels in Argentina and Peru, the Alps of Switzerland, and the high mountains in New Zealand. Every time I spend any time in the mountains either alone or with others, I get a great sense of my place in the world. I love the clean air, the majesty and ruggedness of the environment, and the feeling of being basically a speck of dirt on this great planet we inhabit. The feeling is compounded even further after being subjected to the chaos of busy cities. This is exactly the circumstances in which we started our high Atlas trekking. We’d just spent a night in Casablanca and a day and night in Marrakech, which is the very definition of chaotic in the centre of the Medina. We awoke early on a Monday to be picked up by a taxi drive who shuttled us from Marrakech to the village of Imlil, nestled in the foothills of the High Atlas. Our ultimate objective was to summit Mount Toubkal, which at 4,167m is not the tallest mountain I’ve ever climbed, but the highest of north Africa. We’d be spending 3 days and 2 nights trekking. We had a guide, a muleteer, a cook, and at the last minute, learned 2 other trekkers (from Scotland) would be joining us. The weather? Absolutely amazing. Bright, sunny, and warm all 3 days. So no need to dwell on that. Obviously we’d have done it no matter what the weather, but no rain was certainly a treat compared to my mountain experiences last time in Africa at Kilimanjaro and Mount Meru. Our first day wasn’t too bad. We spent probably 4-5 hours total trekking, heading gradually up the valleys and around some of the smaller mountains to get to our eventual ‘refuge’ for the first night. Along the way, we stopped for our lunch, which as per usual on these types of trek, was amazing. Fresh prepared food with fresh ingredients. And of course, they always give you way too much food. We were getting to know our guide and the two other crew on the trip, and although there was a slight language barrier, we all got along well. Day 1 was definitely impressive for the sights, and knowing that the best was yet to come put me in high spirits. The High Atlas are impressive not only for their rugged beauty, but the fact that they completely surround you. Very rocky and barren, with many criss-crossing trails in some spots. The area has been used for a very long time for grazing sheep and goats, and has even played a strong part in the history of the country as a stronghold for keeping enemies at bay. Instead of tents, we were lucky enough to be able to use a refuge for sleeping. Basically, sleeping mats in an open room with blankets. With no electricity and early sunset, our night ended pretty early. I grabbed an ‘alpine shower’ in a drip of cold water, and tried snapping pictures in the light of a near full moon, but still hit the hay around 9am. Good thing too, as our next morning started bright and early. This day, we’d have at least 6 hours solid trekking. It started kinda chilly, but passing waterfalls and having the sun rise and light up the mountains around us made it a joy. We also had a very steep switchback climb up a scree valley to keep us on our toes. Deanna and I had struck out on our own and were between the two helpers, while our guide was farther back with the another trekker. It was nice to just be totally on our own out there. The sights of day 2 were even more impressive than day 1, and I was clearly starting to fall in love with the Atlas mountains. Definitely high on my list of favourite treks. Once again, we stopped for lunch, and our spot had a perfect view of our conquest, Mount Toubkal, looming across a valley from us high above. We could also see our camp for the night, further down a valley. Sadly, we’d be descending to it, only to have to climb back out for the summit. Once at the Toubkal Refuge, we talked about summit plans. Most climbers start at first light, get there late morning, then head back down valley. However, I convinced the team that we should head out around 2am in order to be at the summit for sunrise. This was met with some resistance, but I’m quite sure if you ask everyone now, they’ll agree it was the right call. The climb up, although in the dead of night, was amply lit by the light of the moon. We had the trail completely to ourselves. It wasn’t an easy climb, but we’d given ourselves the right amount of time. We actually put climbed the last bit before the sun even rose up. There was early morning glow, but no sun yet. The summit? Well, we had that completely to ourselves as well. It was absolutely spectacular in all respects. Of course, it was also quite cold, so we didn’t stay super long, but at least 20 minutes. Eventually I’ll have some video up. Our return path was also different from most people. I’d also convinced us to take the ‘south col’ route down. Pretty treacherous at the top, and then heads down another scree valley to meet the main trail far below. It is also the final resting place of a crashed airplane from the 1970s. The debris field was quite large, with interesting bits of twisted metal all around. It was only 8am as we were heading down the last bits, but we’d already put in a solid day of hard climbing. However, we stil had another 6 or so hours of trekking to get us all the way back to Imlil. We were all a bit tired, but just plodded on, one foot in front of the other. Deanna and I were the only trekkers in our group to actuall hike the whole thing, and we were pretty strong. I was very proud of Deanna in the mountains, and can’t wait for the day we head to Nepal to do some serious mountain trekking :-). Lunch on this day was in a holy village in the valley heading back to Imlil. It was a great time to take a little crash and lay in the sun. Just the re-charge we needed to take us to the end, and in time to watch one of our mules go a little crazy! Ask me in person some time about that. With the mountains out of the way, I now take you all the way to the northeast of the country, the Friouato Caves, reputed to be the deepest in North Africa. To quote one of our guidebooks “The sense of descending into the entrails of the earth is exhilarating.” We can attest to that. However, this was no multi-day affair. We basically made this a day trip from Taza. The trip to and from was just as exciting too. We left our hotel in the morning, used a grand taxi to get us there, then planned on hitching a ride back to Taza to catch a train to Fes. We didn’t realize that getting a ride back would prove challenging. But it was. The caves are NOT on the beaten path, so walking along the road we saw almost no cars, and we were 27km or so from town. One car going the other way even stopped and gave us fruit as we walked, which was super cool. Eventually, we DID get picked up (after several km trek in the hot sun). This fellow was exactly what I hoped. His car was actually barely running. He didn’t want to stop, as the car might not start again, but since it was mostly downhill, he took the chance. We had great conversations on the ride back to town, and he refused payment, offered advice, and even pointed out restoration work being carried out by UNESCO in the area. All this contributed to Deanna’s decision that Taza was probably her favourite place. A quick filling lunch, with more friendly locals, and we caught our train to Fes. But what about the caves you’re wondering? In a single word, cool. Not breathtaking or amazing, but cool. I’ve had the good fortune of seeing a couple other cave systems now, the best being the Lucky Strike caves in New Zealand, and the level of care they take inpreserving those sort of put Friouato to shame. The public access to the Friouato caves is well worn with foot traffic, and there is a fair bit of just mud. Also, many of the stalactites and stalagmites have been damaged, which was sad to see. Kind of how you feel when you see someone break a piece of coral reef that you know took decades to grow. In spite of that though, there were some amazing sections of curtain stalactites, water pools, and just general grandeur to take in. You have the option of just going to the mouth of the cave for one price, or you can pay to have a guide walk you 3km into the cave, then retrace the steps. Obviously we got the guide. We are unlikely to ever return, so spending the extra money was worth it! I will say this for these caves. They are massive. Compared to all others I’ve been in, these ones boggled the mind. For the entire 3kms, we were in pretty wide open cathedral-type spaces. In other caving trips, there was lots of crawling through little openings, and lots of narrow passages. Not here! Just wide open spaces. Of complete darkness. We’d shown up pretty early in the morning, so once again, we had the place to ourselves. In fact, we sort of woke up both the cafe / shop owner and the guide. We basically made them open up the caves for us. Not sure how they liked that. However, our books said it was open at 8:30, and we showed up at 9am, so we didn’t feel too bad! Overall, I’d say Deanna was also pretty impressed with this experience. She had no idea what to expect, and I think it’s safe to say that it blew her non-expectations out of the water. Just the descent into the cave system entry was really cool. Over 500 steps carved in rock from the top to the bottom, created in the 1930’s by French spelio-dudes. Unfortunately, it was very difficult to take any pictures that would do it justice. So there you have it. The highest highs and lowest lows of Morocco for us. Next up in the series will be a story about a true first for both of us, and another of the highlights of the trip. Till then, hope you all enjoyed this post, and check back for the next installment!